ImaginePhd helps doctoral students and postdoctoral scholars explore careers through job families. Doctoral students and postdoctoral scholars in the humanities and social sciences across the country and beyond have some new help to discover a world of career possibilities, thanks to an employee in Graduate Studies. ImaginePhD, a free online tool for career exploration and planning, was launched Monday by the Graduate Career Consortium. Teresa Dillinger, academic administrator of professional development programs for the graduate division and a member of the association, has led the project over its three years of development. 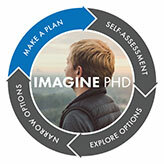 ImaginePhD provides tools for career-related assessments. Then an algorithm helps users compare the results with careers in 16 job families in the humanities and social sciences. The website offers detailed information about careers and resources including sample job descriptions, cover letters and resumes. Another section offers a goal-setting application for mapping out individual plans for career and professional development. Teresa Dillinger, academic administrator of professional development programs in Graduate Studies, is co-author of an article about ImaginePhD, published today. Dillinger, who earned a doctoral degree in geography from UC Davis in 1997, said the project was born out of a discussion during a mentoring workshop for faculty on campus. Later, she took the proposal to the consortium, whose members provide graduate-level professional and career development at institutions in the United States and Canada. With nearly 20 years of experience guiding career and professional development for graduate students on campus, Dillinger led the project involving some 80 people from 56 universities. UC Davis contributed $10,000 to the project. Josephine Moreno, diversity officer for Graduate Studies who serves students in the humanities and social sciences, is among campus employees who worked on it.